It was a Tuesday like any other. And then it wasn't. A simple encounter at a supermarket changed Carin Fletcher's and Leann Cane's lives – literally. Suddenly Carin, a pretty, self-absorbed, underemployed college graduate, finds herself living as Leann, an uneducated, perennially poor, obese checkout clerk, and vice versa. Carin is at first horrified: she’s enormous, she can barely make ends meet, her husband is an abusive loser, and she's saddled with the kid Leann had when she was a teenager. Meanwhile, Leann is initially thrilled: she's escaped destitution, she looks like a model, and people treat her completely differently. But as the days pass, it becomes clear that life isn't clear-cut for either woman. Carin finds herself attaching to Trevor, Leann's precocious son, and developing feelings for Jimmy, a fellow employee who treats her with the respect few others bother to give her because of her appearance. At the same time, Leann is living a life she's always wanted in a body she's always dreamed about, but that doesn't mean that all of her problems have gone away...and a new one is emerging with Carin's sometimes-boyfriend. Both women are facing unknowable futures that neither could have imagined. Are they destined to live this way forever? And if so, where will it all lead? 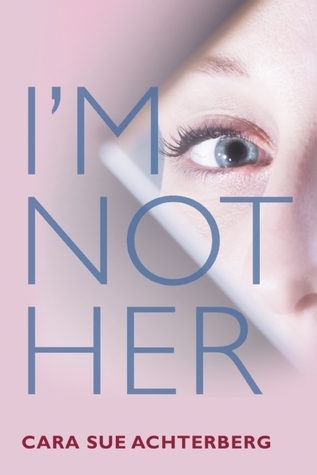 A brilliant, nuanced, and surprising tale about the way the world sees us and the courses we are on, I'M NOT HER is a remarkably assured first novel that introduces a profound new storyteller. We have two main characters in this story. We have Leann and Carin, and the book is written back and forth between the two characters. Meet Leann Cane: An employee/cashier at a grocery store called Shop N’ Save, who happens to be overweight and does not take care of herself at all . . . this is the problem our next character has with this woman even though she doesn’t even know her! She is very judgmental, and, this next character is . . .
Carin Fletcher . . . Carin is a customer who shops at this store, the Shop N’ Save, where Leann works all the time in the evenings, and Carin is EXTREMELY critical about Leann who is so overweight and doesn’t take care of herself at all. Carin always seems to get this cashier and doesn’t like her too much just because of how she looks - judging her by the way she looks. Carin believes in healthy eating and exercise of which apparently Leann does not. (If only Carin knew the real truth, which she soon will.) This is only Carin’s opinion because Carin knows nothing about Leann, but she is about to. It’s great these two girls’ journey together who learn so much about each other and life, in general. They learn you can NEVER “assume” you know things about a person until you really get to know them. ‘Before you say or judge anyone about anything, first walk a mile in their shoes', etc.’, well, this saying couldn't be any closer to the truth. Each of these girls are about to learn just that. They are going to learn what it’s like to walk in the other’s shoes! So what happens? This gets great! A BODY-SWITCH HAPPENS! Each girl ends up in the others’ body, and they learn some extremely important lessons from it! The way this happens is not realistic at all, they bump into each other's heads, but try to accept this story just as it is written and don’t try to find yourself questioning it to find a way to make it realistic like I did. Try to just go along with the story so you can enjoy it! I resigned to keep an open mind and then I enjoyed the story even more. This was the only thing that kept me from rating this a 5-star book, the way it happened. I thought the author could have found a more creative way to have it happen than what she did. The writing does flow very nice and smooth keeping you glued to the page, my kind of story! This book does have a very important message to tell us, too, and it is the only way this author made it happen in this book to tell it. This is the only stretch of the imagination you’ll be asked to do through the rest of this book, and maybe one more time so the girls can go back to normal! This book is really meant to be taken seriously, as this issue is very serious. The weight issues both girls have are the most important in this book and it is what this author is trying to portray. I believe all of us women have weight issues, just some of us are bothered by them much more than others. What do the girls do about this? This is a great way for both girls to learn more about weight issues that plague ALL of us women so much today, especially when we see other women who are so overweight (and us, too, possibly, as this is a huge problem today, and there we are! Judging away!) showing each other the other person is still a human being with values, feelings, and a human being worthy of being treated that way, too, just because someone may be heavy and have 15, 30, or even 50 pounds or MORE to lose, please understand these ARE still women (and men), who are very real “people” worthy of being treated as such at ALL TIMES! They are NOT to be abused, hit, talked down to, or treated differently. This ‘body-switch’ does a great job with each character learning about how they feel in the body they now have, either thin or overweight. The book touches on issues of being overweight such as excess sweating, rashes that occur from it, and other things we may or may not ever know about or even give thought to due to being larger and our skin or other areas being affected. I think this is a terrific book to bring this information forward to the public’s knowledge. This really is what the NEW Carin needs to have happen to her because she has judged Leann SO harshly! What a shame, or, this could be a plus, even though she feels so disgustingly FAT! She feels sweaty, all of her clothes are too tight. She can’t allow this little boy to stay by himself, either. She realizes to herself, 'Hey! Leann has a son!' This little boy doesn’t have a father or any other adult around them to help out, it’s just the two of them, even if his dad does happen to comes around. She decides to stay to take care of this little boy after all. What she did not plan on was being married to such a huge and non-caring, louse/man/father, and when she finally does see him, she tries to avoid any contact at all! Leann's husband is NOT touching her!! Slowly, and only one day at a time, depending on how much money they have for groceries that day due to the abusiveness of Leann’s husband who thinks she is made of money, Carin/Leann starts to change the way they eat, adds exercise into Leann and her son’s daily life, too. What Leann’s husband refuses to do is to realize the cost of ‘good for you’ food. How long must this go on for, though? This feels like it is an eternity already. Carin/Leann, must protect Trevor from his father, too. She takes this little boy who isn’t hers under her shoulder and cares for him like he’s hers. That was the sweetest thing she could have done. No one asked her to do this, this is all out of the heart of the real Carin. Carin learns why Leann is so overweight. It’s not just from being lazy, but from the choice and kind of foods they have every day. When you don't have much money, you find yourself eating dry Ramen noodles for dinner, dry and out of the box macaroni and cheese. When this is all the money you have, or I should say all you can afford to buy, it's not a healthy choice. Your money is not going to allow you to purchase foods from the Organic Food Aisle like Carin is used to doing. Also, when you have a husband who refuses to give you money for food . . . what do you do? What do you buy? For the girls, their different body images don’t go over so well with the girls psychologically, either. They both have NEW BODIES they never asked for. Maybe it’s going well for the new Carin (Leann) but not for the real Carin. Once they figure out what has happened, this does not go over so well and they want their old bodies back! I highly recommend reading this book. We learn things from both sides of weight, and from the different lives of the girls, and about having and not having money which really controls what being heavy and skinny turns out to be. I liked this one quite a bit! Thanks to The Story Plant and NetGalley for this opportunity to read this book in exchange for a review! Want to #WIN A COPY OF THIS #PRINT #BOOK? Directions: Leave your name and email address below in the comments! Please mix your email address so the bots don't pick it up, for instance, do something like this: laurieisreading at g mail dot com! Please make sure I can read it, though, too! LOL! This #giveaway will go until . . .
PS there is no September 31st. LOL! Thanks! I'll fix that! It will be Oct 1st! (Where was my head? LOL!!!) Appreciate this!